The bestselling book from Linda Tellington-Jones has been completely revised with new photographs and profiles. It offers a positive, no-force approach to training. Using a combination of specific ‘TTouches’ exercises, and exercises over obstacles, a dog’s performance and health is improved, common behaviour issues are solved, and physical problems are positively influenced. By thinking of the dog in ‘perfect’ terms one can come a long way in solving problematic behaviours, training for a joyful partnership, and ensuring their health and wellbeing. The pioneering work of Linda Tellington-Jones, PhD (Hon) has its roots in the practice of Feldenkrais. The Tellington Method was first created 4 decades ago as a system of animal training, which allows people to relate to animals in a deeper, more compassionate way. The Tellington Method utilises a variety of techniques of touch, movement and body language to affect behaviour, performance, and health, and to increase an animal’s willingness and ability to learn in a painless and anxiety-free environment. The method for horses, first developed in the 1970’s, is known as TTEAM (Tellington TTouch Equine Awareness Method). 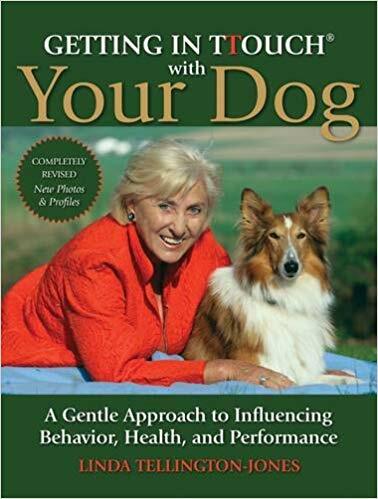 In the 1980’s, Tellington TTouchbroadened to include the world of companion animals, developing techniques that deepen mutual trust and understanding and strengthen the human/animal bond. During this period, the work was also introduced as an effective and valuable method to reduce stress in wild life rehabilitation and to enhance the well-being of animals in zoos. Linda is a visiting faculty member at the University of Minnesota where she has co-taught Tellington TTouch for humans annually since 2002. At this time Tellington TTouch was included in the research program at the University of Minnesota. The results of studies on humans by Cecilia Wendler, PhD, RN, CCRN have been published in three prestigious professional nursing journals and the Journal of Applied Animal Welfare Science. Through her non-profit organization, Animal Ambassadors, Inc®, she supports projects of children working with animals to enhance understanding, compassion and quality of life for both humans and animals. Awards include: 2008 Honorary Doctorate degree from Wisdom University, ARIA Teacher of the Year for the American Riding Instructors Association, 2007 Inductee into the Massage Therapy Hall of Fame,1994 Horsewoman of the Year Award from North American Horseman’s Association, 1992 Lifetime Achievement Award from the American Riding Instructors Association, and 1969 Award for Creative Citizenship from the State of California.